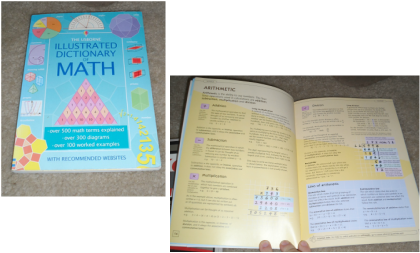 One book I never forget when I walk into my classroom to start another lesson is The Usborne Illustrated Dictionary of Math. As a dictionary, it's not terribly wonderful, but it has almost every mathematical term, concept, and process from elementary to high school written out in fairly plain language. Whenever I forget formulas, processes, etc. I simply whip this guy (his name is Martin) out to ask. Students also use Martin when we have individual or group work time when they need to refresh their memory on something as well. The only time he's ever failed me was in my analysis class at Michigan State, but he doesn't claim to know all that anyway, so I guess I can't blame him. I have dyscalulia, which is specific to numbers, which means my students get to correct me a LOT when I write problems on the board or read them aloud. Most of the time, I'm okay because I've learned how to cope with it better and slow down, but it was hard going through elementary and middle school not knowing if my numbers were being flipped around or not and not knowing how to fix it.